In this Dec. 1, 2018, photo, President Donald Trump, second from right, meets with China's President Xi Jinping, second from left, during their bilateral meeting at the G20 Summit, in Buenos Aires, Argentina. American envoys are due in Beijing for talks Monday in a tariff battle over Chinese technology ambitions. The trade war is currently in a temporary truce, but should that change the economic fallout threatens to hobble global economic growth. The two days of meetings are aimed at carrying out the December 1 truce by Presidents Donald Trump and Xi Jinping that postponed additional tariff hikes, the Chinese Ministry of Commerce announced Friday. It said the American delegation will be led by the deputy U.S. trade representative, Jeffrey Gerrish, but offered no other details. The talks are going ahead despite tension over the arrest of a Chinese tech executive — Huawei’s chief financial officer, Meng Wanzhou — in Canada on U.S. charges related to possible violations of trade sanctions on Iran. Despite anger from Beijing over Meng’s arrest, Chinese officials have repeatedly signaled their desire to keep that issue from affecting trade talks. 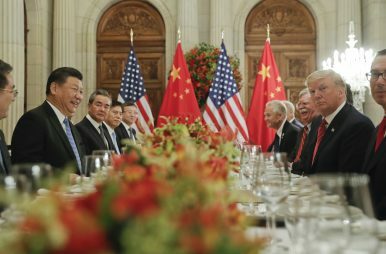 The U.S. and Chinese governments both have expressed interest in a trade settlement but give no indication their stances have shifted. They hope to have “positive and constructive discussions,” said a Chinese foreign ministry spokesman, Lu Kang. The clash reflects American anxiety about China’s emergence as a competitor in telecoms, solar power, and other technologies and complaints by Washington, Europe, and other trading partners that Beijing’s tactics violate its market-opening obligations. Trump wants Beijing to roll back initiatives including “Made in China 2025,” which calls for state-led creation of champions in robotics, artificial intelligence, and other fields. American officials worry those might erode U.S. industrial leadership, and complain that China’s technological prowess is underpinned by the theft of intellectual property from U.S. firms. China’s leaders have offered to narrow its politically sensitive trade surplus with the United States by purchasing more soybeans, natural gas, and other American exports. But they reject pressure to scrap technology initiatives they see as a path to prosperity and global influence. Chinese economic growth fell to a post-global crisis of 6.5 percent in the quarter ending in September. Auto sales tumbled 16 percent in November over a year earlier and weak real estate sales are forcing developers to cut prices. Meanwhile, data released at the end of 2018 showed that manufacturing in China unexpectedly declined in December, for the first time in two and a half years. Third-quarter U.S. growth was 3.4 percent and unemployment is at a five-decade low. But surveys show consumer confidence is weakening due to concern growth will moderate this year. Beijing has tried in vain to recruit France, Germany, South Korea, and other governments as allies against Trump. They criticize his tactics but echo U.S. complaints about Chinese industrial policy and market barriers. The European Union filed its own challenged in the World Trade Organization in June against Chinese regulations the 28-nation trade bloc said hamper the ability of foreign companies to protect and profit from their own technology. Trump and Xi agreed to a 90-day postponement of more tariff hikes due to take effect January 1. But economists say that is too little time to resolve the sprawling disputes that bedevil U.S.-Chinese relations. The decision to hold this week’s talks at a deputy minister level reflects the need to work out technical details before higher-level officials make “hard political decisions on major issues,” said Tu Xinquan, director of the China Institute for World Trade Organization Studies at the University of International Business and Economics in Beijing. Trade Representative Robert Lighthizer is the top U.S. official in the ongoing trade discussions, while Vice Premier Liu He is China’s top representative. The lower level of these discussions signals that the two sides are still far apart on various issues. In addition to Gerrish, the U.S. team will include the Office of the U.S. Trade Representative’s top negotiator on agricultural issues, Gregg Doud; Treasury Under Secretary for International Affairs David Malpass; Commerce Under Secretary for International Trade Gilbert Kaplan; the U.S. Agriculture Department’s under secretary for trade and foreign affairs, Ted McKinney; the U.S. Department of Energy’s assistant secretary for fossil energy, Steven Winberg; and other senior officials. The makeup of the U.S. team was announced Friday by the trade representative’s office. The dispute has rattled companies and financial markets that worry it will drag on global economic growth, already showing signs of declining. Chinese exports to the United States held up through late 2018 despite Trump’s tariff hikes. But that was due partly to exporters rushing to beat new duties — a trend that is fading. Some manufacturers that serve the United States have shifted production to other countries. The investment bank UBS said Friday that 37 percent of 200 manufacturers surveyed said they have shifted out of China over the past 12 months. It said the threat of U.S. tariff hikes was the “dominating factor” for nearly half, while others moved due to higher costs or tighter environmental regulation. Despite the December truce, “most firms expect trade war to escalate,” the report said. By AP Business Writer Joe McDonald with additional reporting by The Diplomat. Could China play the good cop while the U.S. plays the bad cop?